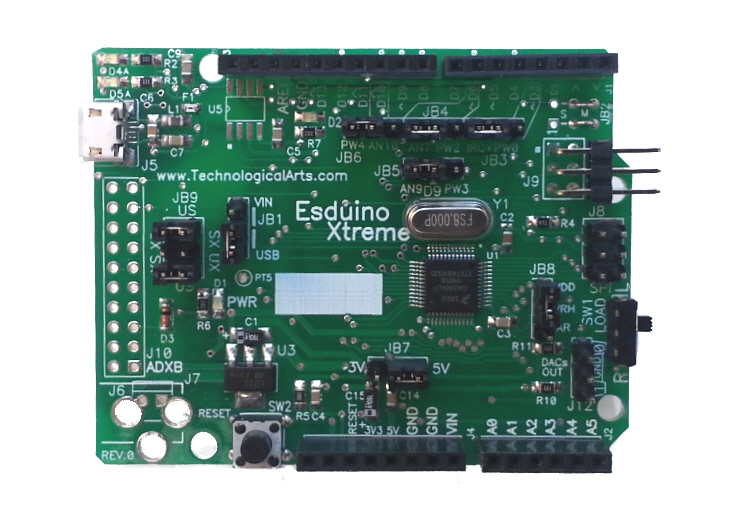 EsduinoXtreme is a next-generation Arduino-style board based on the feature-packed 9S12GA240 microcontroller from NXP! What this means is that you can now easily utilize this powerful NXP 16-bit microcontroller in your OEM product, college curriculum, or project by leveraging any of a great number of Arduino-style "shields" (i.e. stackable application boards) and accessories already available from various sources worldwide. And if you can't find one that exactly matches your needs, you can always design your own, using the open-source hardware design files you'll find on the internet. Since EsduinoXtreme is based on S12, your code can be developed using any available S12 tools (e.g. CodeWarrior, AsmIDE, GCC, ICC12, Cosmic, etc.). An on-chip Serial Monitor supports flash erase/program, memory and register manipulation, instruction tracing, disassembly, and more-- all without a BDM pod, using our free uBug12 multi-platform utility. For more advanced development, such as source-level debugging with CodeWarrior or other compiler, you'll need a BDM pod like our USBDMLT. header support for adding low-cost Xbee or Wifi interface. Add our optional ADXB adapter to implement XBee RF module. 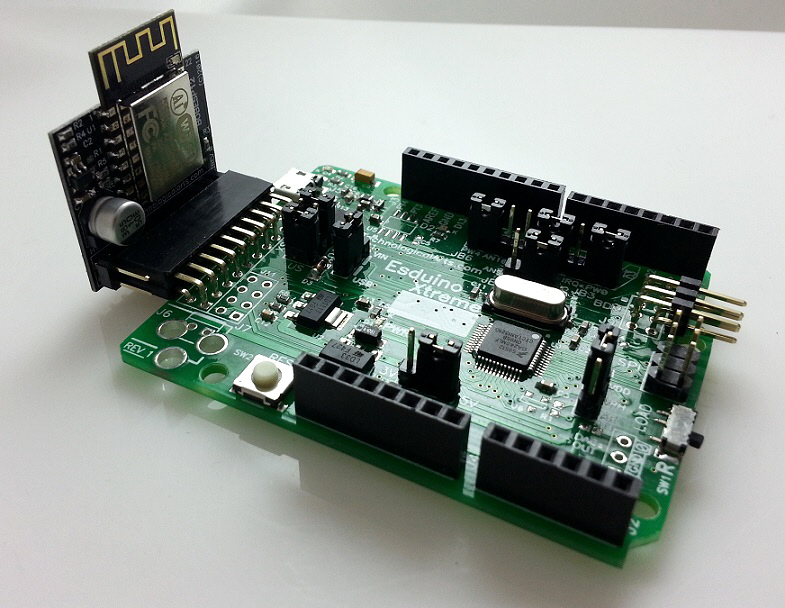 Or add our new BOBESP12 WiFi adapter featuring an FCC-approved ESP8266-based module. Arduino is an open-source physical computing platform originally based on an Atmel 8-bit microcontroller. Originating in Italy, it has become very popular worldwide over the past few years. 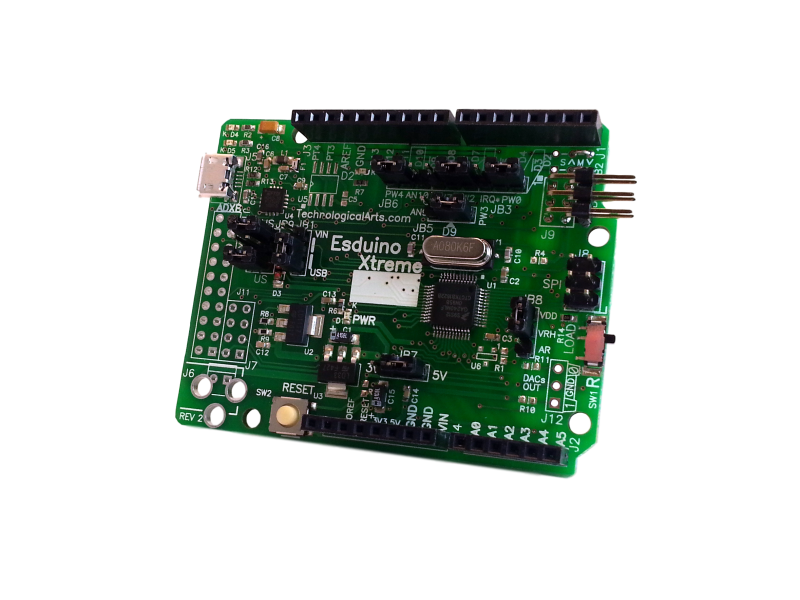 The creators of Arduino refer to any application board designed to plug onto it as a "shield". Many shield designs were created using the free version of CadSoft's Eagle schematic capture and circuit board layout program. There are probably more than a hundred shields aready designed and offered for sale on the Internet, and more are being created all the time. If you want to customize any of them or design your own, you can download Eagle and any of the open-source design files you'll find on the Internet. Then you can modify them to suit your needs, and use a PCB prototyping service to have the boards fabricated for you. If you don't want to layout a PCB, you have the option of building your application by hand using point-to-point wiring with one of our high quality Prototyping Shields, or using a solderless breaboard shield. Data sheet, schematic diagram, code examples, etc. Special Edition of CodeWarrior for HCS12(X). (runs on Windows; 32K code limit for C programs, no code limit for assembly-language programs). Be sure to also download and install the G240 service pack.